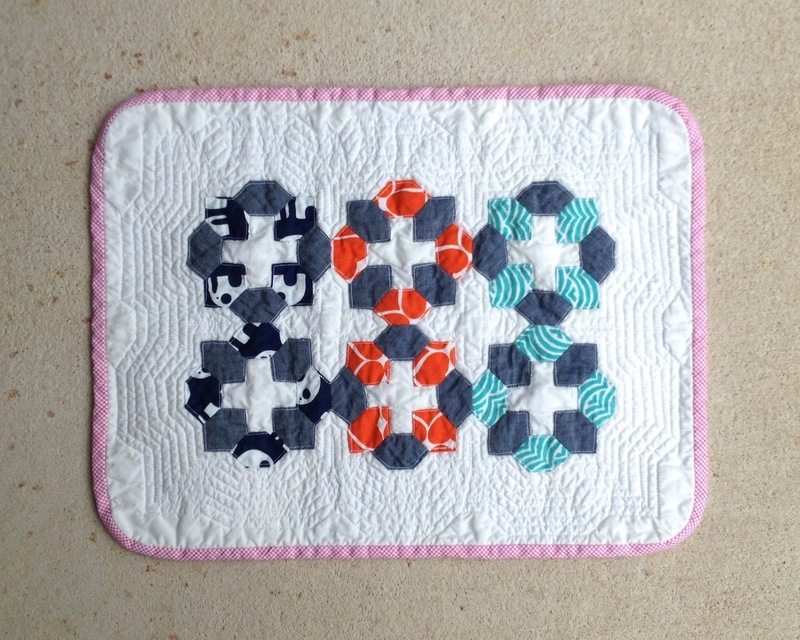 I have another baby quilt to share with you today! 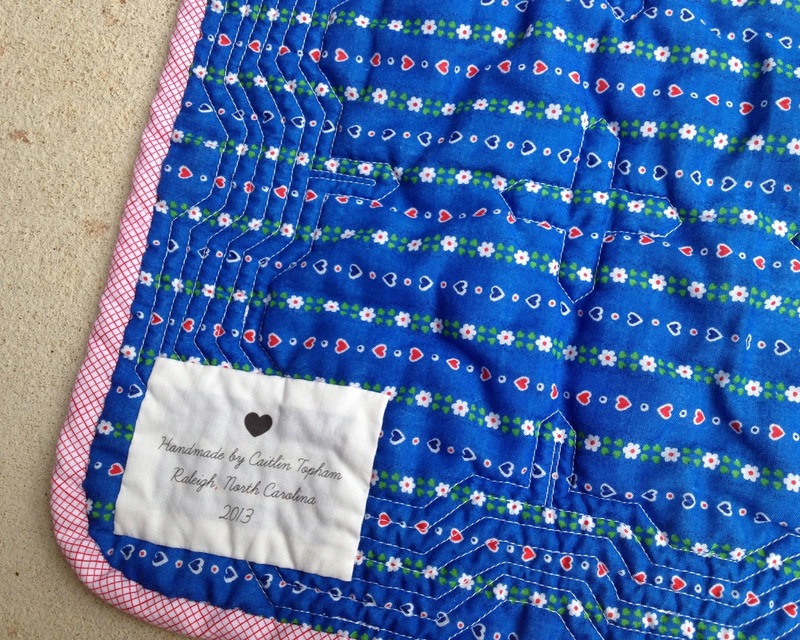 I started this quilt back in 2013, over the Thanksgiving break, while vacationing on the Outer Banks with my family. I love bringing English paper piecing projects with me when I travel, and that trip was no exception. 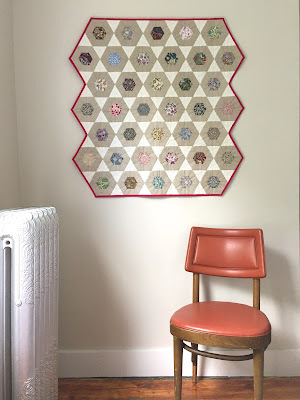 I brought a stack of hexagons with me that I'd made by piecing together solid scraps from my stash. So when I found out she was expecting her first baby this March, and knowing I wanted to make her a quilt, I immediately thought this work in progress would be the perfect gift for her. For the quilt's top, I hand appliquéd the hexagon shape to a solid navy background. For the back, I raided my stash for lots of colorful prints, which both coordinated with the top and spoke to me as being fabrics Natalie would like: vibrant blues, teals, and pinks. I even included a bit of leftover piecing from my Fernweh Quilt in the bottom left corner. I loved putting together this quilt knowing that it would go to a fellow quilter, and I am quite happy to say it was ecstatically received. Now I'm excited for March to come, so that I can snuggle that new baby! 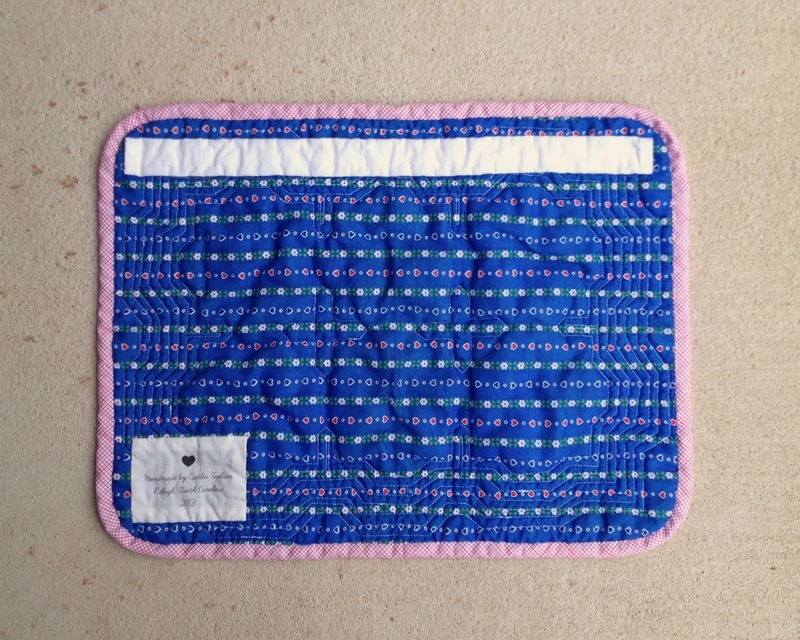 The Modern Sampler Quilt Along is an informal and virtual quilt along where we make a block from Yoshiko Jinzenji's Modern Sampler Quilt pattern each month. You can follow the hashtag #modernsamplerquiltalong on Instagram to get a peek at everyone's blocks, fabrics, and progress, as we work our way through the pattern together. All are welcome to join the quilt along at any point! On the last Tuesday of each month, we gather here to share the blocks we've made; this month we worked on Block K from the pattern. We've reached the 11th block of this pattern (! ), and are only one block away from a complete quilt top. Congrats (and thank you!) to everyone who's made it this far with me! I went pretty scrappy with block K, and added a few pops of vibrant, solid colors to change things up. Similar to block H, I used English paper piecing to assemble my block, since it's both an easy way to put together Y-seams, and a rather meditative practice. How did you piece block K? Let's see your blocks! 1. Click the "Add your link" button below, and link to a blog post or Instagram photo of your Block K. In the "Link Title" field, enter your blog name or Instagram handle. The Modern Sampler Quilt Along is an informal and virtual quilt along where we make a block from Yoshiko Jinzenji's Modern Sampler Quilt pattern each month. You can follow the hashtag #modernsamplerquiltalong on Instagram to get a peek at everyone's blocks, fabrics, and progress, as we work our way through the pattern together. On the last Tuesday of each month, we gather here to share the blocks we've made; this month we worked on Block H from the pattern. Welcome to the first post on the new blog (and web site)! Please take a look around, and let me know what you think! I really enjoyed the process of making this month's block, especially because I was able to employ one of my favorite sewing techniques: English paper piecing. I also included a few treasured prints, including hand-printed fabric by Maze and Vale. How did your blocks turn out? Let's see them below! 1. Click the "Add your link" button below, and link to a blog post or Instagram photo of your Block H. In the "Link Title" field, enter your blog name or Instagram handle. When my husband and I traveled to London in the spring of 2012, a trip to the Liberty of London flagship store was obviously a must on my to-see list. As a souvenir of my visit, I purchased a packet of precut Liberty Tana Lawn hexagons, prepped and ready for English paper piecing. 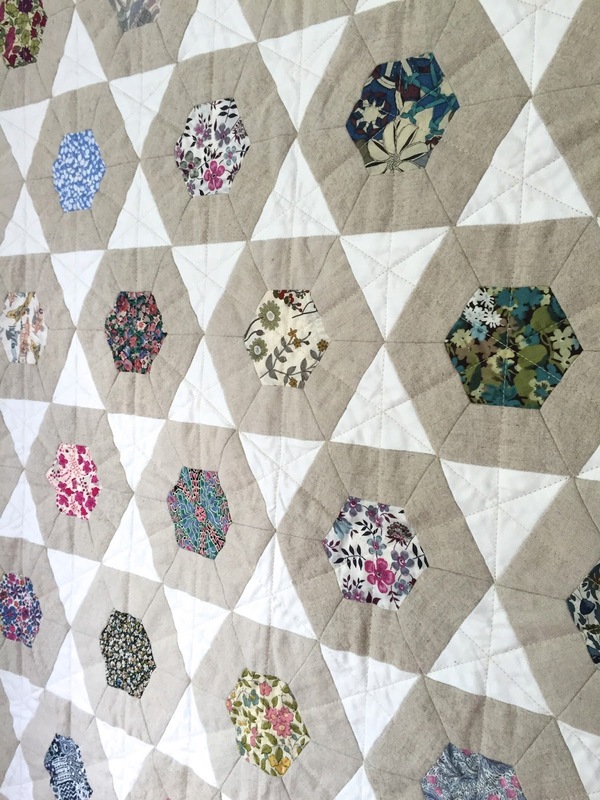 For a dear friend's birthday this month, I stitched up a small wall quilt, using prints by Umbrella Prints from my fabric shop and some scraps of chambray. Inspired by Betsy's honeycombs, I stitched up my own by hand, using an English paper-piecing technique. I then machine-appliquéd the honeycombs to my quilt top and did echo quilting around the edges. I stuck with my now-favorite rounded corners, and used up the rest of the binding I had made for this quilt. I used a coordinating vintage blue print for the backing, and I added both a label and a hanging sleeve. I loved having the chance to work with these prints (they're among my favorites) and I'm happy to report that the birthday girl loved her gift.